The largest poloidal field coils—too large to be transported by road or sea—will be manufactured in a facility on the ITER site. In August, Europe awarded the first in a series of work packages related to their fabrication. The first of a number of work packages for the manufacturing of ITER's poloidal field coils has been signed by the European Domestic Agency, Fusion for Energy (F4E). The Engineering Integrator contract was awarded to ASG Superconductors (Italy) in August 2013. 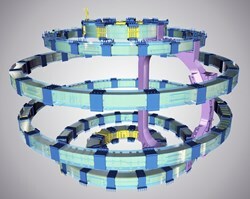 As Engineering Integrator, ASG will be responsible for issuing a manufacturing plan for ITER's poloidal field coils that defines the manufacturing layout and workflow, including manufacturing drawings and procedures for the production of all the poloidal field coils to be produced in the on-site Poloidal Field Coils Winding Facility. The manufacturing plan, developed in compliance of rigorous quality assurance, will establish the control of manufacturing activities and the production schedule. ASG will also support F4E in the procurement of the tooling and equipment for component manufacture and supervise the manufacturing and cold test activities. A team of approximately 20 engineers will work under the contract, worth approximately EUR 27.5 million. Europe is responsible for the fabrication and testing of ITER poloidal field coils 2-6 (poloidal field coil 1 will be supplied by Russia). Coils 2-5 will be manufactured and tested in Europe, while poloidal field coil 6 will be manufactured in China and cold tested in Europe. Cold testing will involve cooling the coils to low temperatures (80 K) in order to reproduce the thermal stresses that will be experienced during ITER operation. In addition to the Engineering Integrator contract, work packages are under preparation by F4E to cover the tooling, site and infrastructure, manufacturing and cold testing of the poloidal field coils. Focus will now be on implementing the engineering contract and negotiating the next procurement, which is for the tooling necessary for winding operations. Read more on F4E's website.